Saw a great deal and couldn't pass up More details later. Too bad it is not a... TL6MT. Nice car though! how much did you pay and what mileage? I paid $5800 and it was just below 182,000km. It was a great deal that I couldn't pass up. It was owned by an older gentleman who had every service record, all done at the dealership. It was involved in a very minor low speed accident in 2012, which the front bumper and grille was replaced. 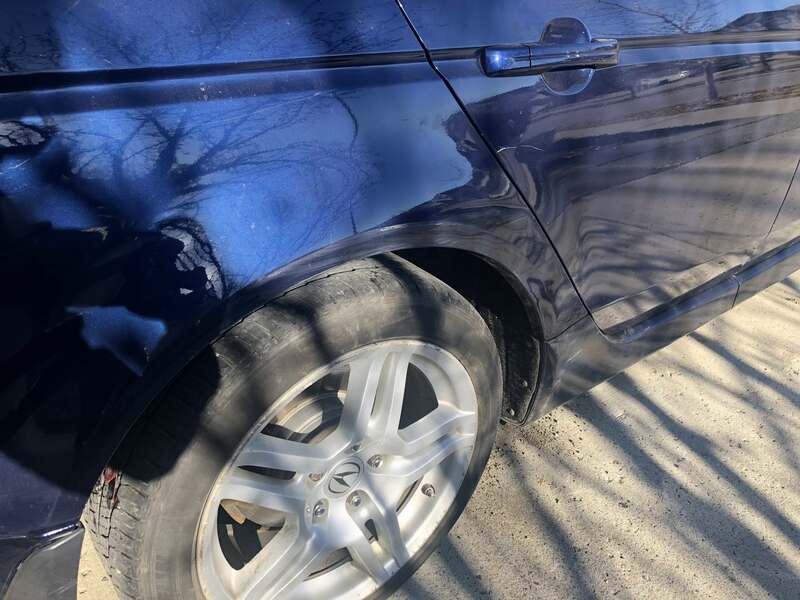 Some scratches on the car, especially near the rear passenger's side quarter panel where he scraped the car coming out of the garage. 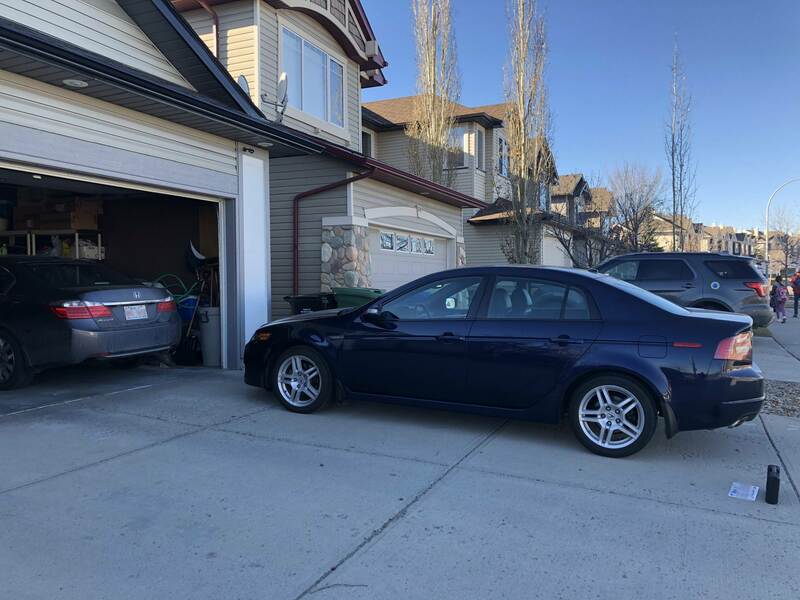 My friend @tanger's 2006 Acura TL with navigation that he bought for $6000, about 190,000km and comes with winter tires on OEM alloy rims. 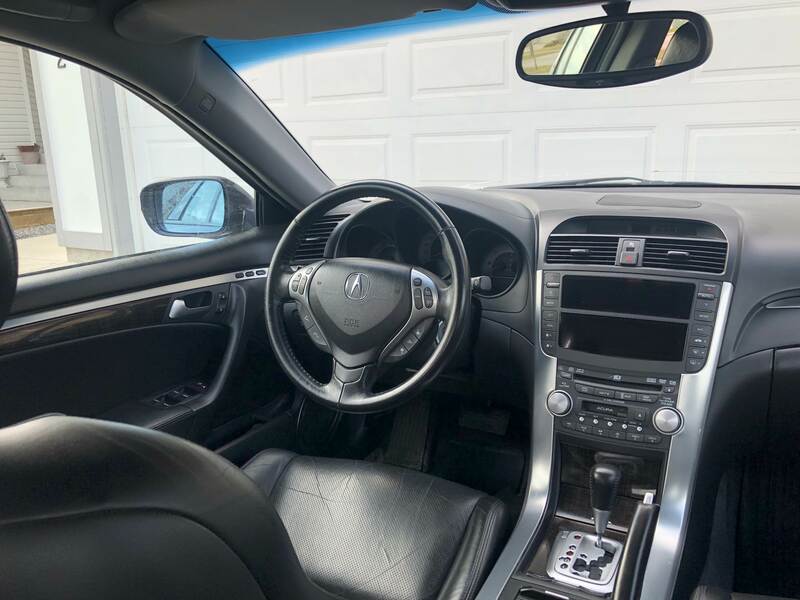 Detailed the interior. It was decently clean when I got it, but not up to my standards. I cleaned everything inside thoroughly. There were some stains on the gear lever sliding cover and crumbs around the edges of the center console panels. The compartments are also dirty inside. I noticed some minor scratches on the screens in the middle, which I polished out. I then conditioned all the leather and applied dressing on the plastic panel pieces. Of course, I sprayed my favorite spray, the New Car Smell spray Now the interior is great for a 10 year old car. Next, the scratches on the rear quarter panel. He didn't bother touching up the paint, which resulted in some minor surface rust. I removed the side skirt, sanded the rust out, and repainted it. First stage is done, still some scratches around the wheel well. 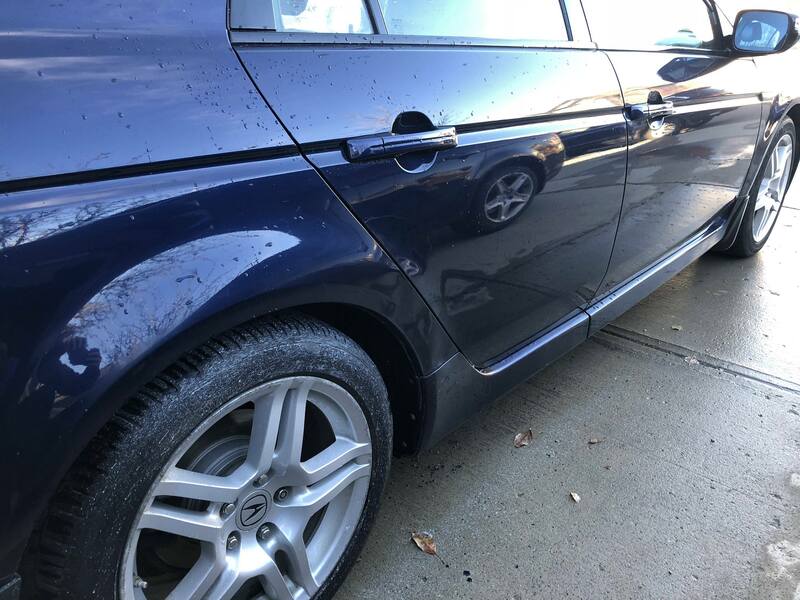 With some advanced polishing and painting techniques, I blended in the paint and it looks practically flawless It's still dented, but I am not too worried about it. Finishing off fixing the cosmetic issues of our cars. Congrats on the Car chc - it looks like its in great shape for the Year. Also 110000 miles is nothing for a 10 year old Car. Did the scratch just Buff out? Not exactly. It was a bit of a paint-and-buff technique. The scratches are more than clear coat deep, but I used some paint to fill it and made it flat. 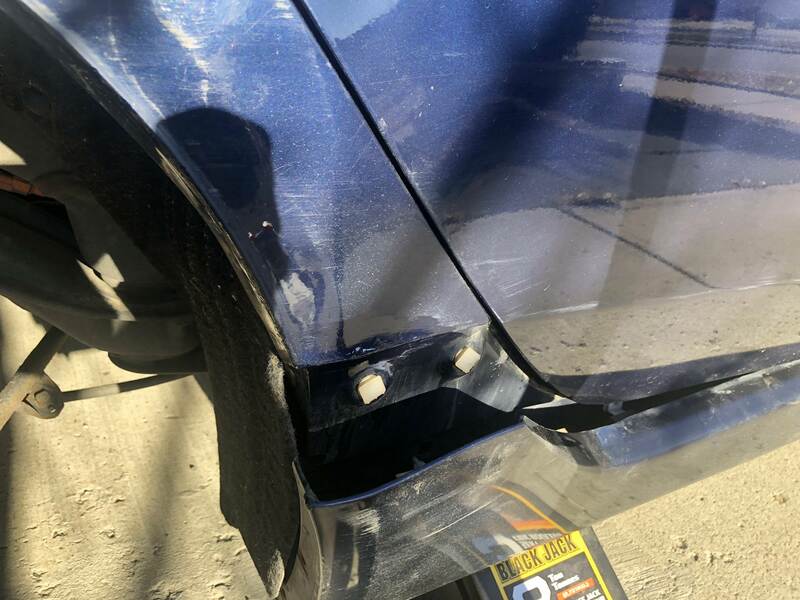 It's a more advanced repair technique -- similar to what I did with my Accord a few years back when I scratched my rear bumped (the whole bumper has been refinished since then) -- and the results are great. Getting winter tires on today. We'll see if the shop can fix the bead leaks. Bead leaks are usually quite easy to fix, just reseal and go - they probably do it for free with tire mounts. Nice photos and great detailing work as always. I took it to the shop on Thursday. I've had them reseal the beads for all four rims while I got my X-ice Xi3's mounted. The problem was the leakiest rim's beads were bad and they had to conduct a minor repair. It wasn't free, but they only charged me $20 for all the extra work they had to put in. 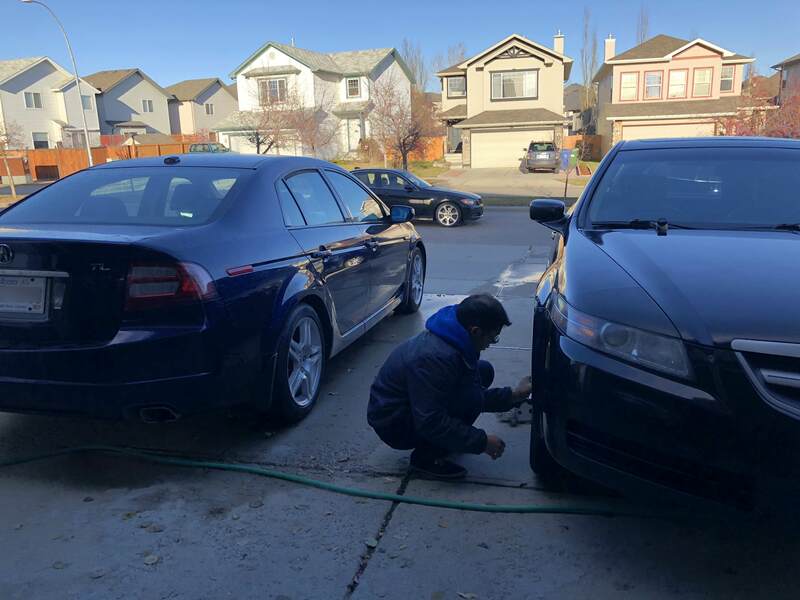 I took it to Limitless Tires in NE Calgary, close to Tint-Tech. First time going to the place. They had the cheapest price in town, charging only $15/wheel regularly to mount and balance my 235/45R17 low profile tires. Shop was clean and tidy with a nice waiting room, and it was run by a bunch of young friendly car enthusiasts. So far, it looks like the leak is gone, but I need to do a few more tests to verify. They also use a Hunter machine to get the tires off the rims to prevent scratching. I don't know if they actually scratch the rims or not since the ones on my TL is already really scratched, but eitehr way, great guys and it looks like they do great work for a great price. 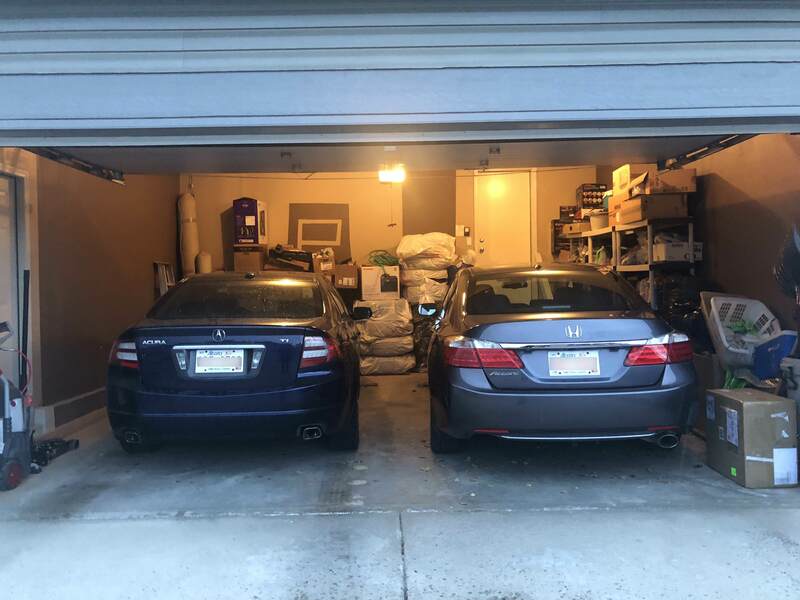 Also you can see how much smaller the TL is compared to my Accord. 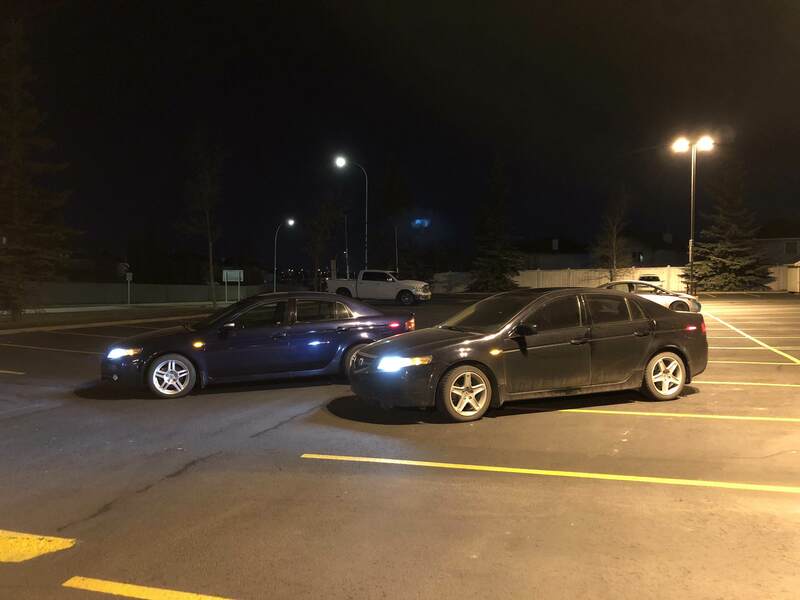 It's like the Accord increased 10% in size in every dimension. Actually I got another tire that started leaking air (the one that was previously leaking was properly repaired). Going back tomorrow to see what happens. Looks like a very good price for the repair work. Looking good chc! 👍 Looks really good chc. As it turned out, looks like I'm going through another air leak problem with the same tire, this time at a slower rate. It was OK for a couple of days and it started leaking again. Not satisfied with the answers I was given, I decided to do a leak test. 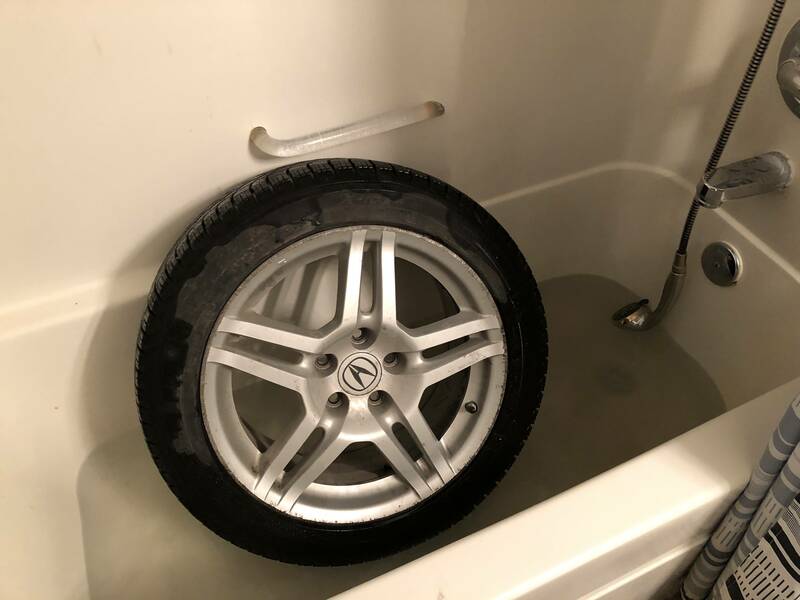 Since I couldn't really see where the leak was with soap, and it was probably not a bead or valve leak, my guess is it must be the tire itself. I looked really carefully for punctures and didn't find any. Therefore, I decided to do the good old bathtub test. I didn't want to waste any water, so I just plugged the drain when I was showering. I guess the extra shampoo and soap helps with indicating where the leak is. I took the wheel off my car and carried it upstairs. Thankfully, they're only 17" rims and it wasn't too heavy. There is a crack next to the "M" on the tire. The sidewall is damaged. It doesn't look like impact damage to me, especially since the rest of the tire was fine. Looks like I need a new tire. 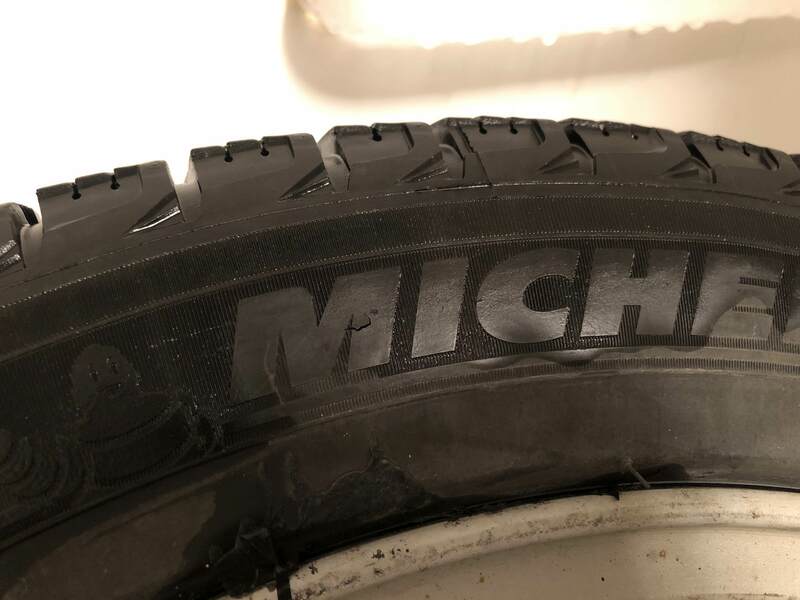 I called Michelin and they said it should be covered, but I need to bring it to a Michelin dealer to do a claim. I booked an appointment with Silverhill Acura on Tuesday next week to see how it goes. You could say taking a shower really... tires it out. Haha yep, I'm glad I found it but now a new problem. Instead of going to the dealership, I decided to go to Canadian Tire, since I think that's where the tires were from originally. Went to the one in Dalhousie in Calgary NW. Terrible service; the people at the desk has no idea what they're talking about and are generally rude and unhelpful. I technically don't even need to buy from them to get a warranty claim, since I'm just buying a tire from them at reduced cost and they get the rest of the money from Michelin. They just made up unrelated excuses not to help so I took the wheel back from them and called Michelin again on how to deal with this issue. You'd be lucky to get any tire warranty but Michelin is much better than Continental. Everyone used to go to Sears for warranty claims since they're everywhere and they are happy to do it. Well looks like no one wants to cover it. Every dealer said it's almost impossible to get money back from Michelin apparently, must be a Canadian thing. I'll just buy a new tire lol. Nobody would do it haha, they all say Michelin is very unlikely to pay them back. On the positive side, almost every dealer offers road hazard coverage for free now.